Ruth Rosenhek and Jane Morrison for reviewing the text and assisting with revisions. Lake Cowal is ephemeral, or semipermanent—it is full seven years out of 10, and dry the others. It is a crucial feature of the Lake Cowal-Wilbertroy Wetlands and the Lachlan (Kalara) and Murray-Darling river systems. The traditional owners of Lake Cowal, the Wiradjuri people, consider the lake and the region around it to be sacred. Countless artifacts can be found at the site, which has been used for camping and ceremony for at least 4,000 years. Ancient marked red river gum trees line the shore and surrounding region, providing a refuge for many species of permanent and migratory birds, as well as some threatened species of native Australian plants, fish and animals. In addition to its cultural significance, the region is distinctive for what lies underground, invisible to the human eye. 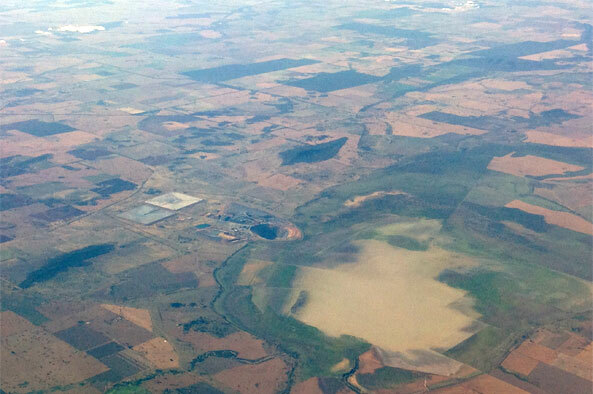 The gold deposit at Lake Cowal, situated on the Lachlan River flood plain, makes it a particularly dangerous spot for mining and cyanide leaching; flooding and consequent environmental damage seem inevitable. Lake Cowal is included in the “Directory of Important Wetlands of Australia” and is listed on the Register of the National Estate for its high conservation value. The region has been acknowledged by the New South Wales National Parks and Wildlife Service as meeting the criteria for protection under the International Convention on Wetlands (the Ramsar Convention) as a Wetland of International Importance, but Lake Cowal has not received this designation, which would obligate Australia to promote conservation and repair. In 1981, Geopeko began exploring for gold around Lake Cowal, which lies about 30 miles from the Wyalong gold fields, which were opened in the 1850s. In 1988 North (WA) Limited resumed exploration for gold at Lake Cowal. The New South Wales Government denied a mining application from North to mine gold at Lake Cowal on environmental grounds in 1996. After two commissions of inquiry, immense pressure from the townspeople of West Wyalong, the company and some unions, the NSW Government approved consent conditions for the mine in February 1999, just before a state election. Rio Tinto bought North Ltd. in 2000. Divesting itself of its gold portfolio, Rio sold its Cowal Gold Project interest to Homestake of the United States, which merged with Barrick Gold of Canada in December 2001. In September 2006, New South Wales Premier Morris Iemma officially opened the mine, although Barrick had first poured gold at Lake Cowal in April 2006. Iemma lauded the potential economic boost to the local community at the opening amid widespread criticism from Aboriginal groups, environmentalists and the Greens party. The mine will eventually involve an 8-year excavation of a hole in the earth more than a half-mile long, 900 yards wide and 355 yards deep on the shore of the lake. Excavation will consume an estimated 4 million gallons of diesel fuel. The only barrier between the lake and the open pit is an earthen wall or “bund.” Low-grade ore extracted from the pit is stripped with a solution of cyanide to leach out particles of gold. Barrick uses 6,613 tons per year of cyanide and other hazardous chemicals to leach gold from Lake Cowal ore. These chemicals are transported through more than 70 communities from Queensland to Lake Cowal. Open-pit mining and cyanide leaching are the most effective methods of gold removal today, but they can have environmentally devastating effects. Cyanide often leaks and spills threaten wildlife and humans. One of the most recent spills occurred in Australia’s Northern Territory earlier in 2007. The incident closed one of the territory’s major roads, the Sturt Highway, for days while authorities cleaned up cyanide pellets that had spilled from a truck. On several occasions and in many locations around the world, cyanide-laden water has left rivers lifeless and undrinkable. A single teaspoon of a 2-percent cyanide solution can kill an adult human. Poisoning can occur through inhalation, ingestion or contact with skin. In the United States, the state of Montana passed a Cyanide Use Bill in 1998 that makes open-pit heap leaching or vat cyanide leaching illegal. In 2000, the Greens of New South Wales, Australia, drafted a bill to ban the use of cyanide in their state, but the bill was defeated. In 2006, the European Court of Human Rights fined Turkey hundreds of thousands of euros to compensate villagers who had sued over cyanide poisoning from a nearby gold mine. This decision forced Turkey to reverse its policy to permit new mines to use cyanide in gold mining. Currently, Argentina, Costa Rica, the Czech Republic, Ecuador, Germany and Greece have banned the use of cyanide in all gold and silver mining. The Lake Cowal Gold Mine has already had drastic effects on the wetland ecology of Lake Cowal, extracting up to 4.5 million gallons of water per day from the region. Barrick managed to secure these water rights despite the fact that the area is under an embargo of new water licenses due to severe drought in central west New South Wales. Australia has already lost 90 percent of its wetlands. The mine endangers many threatened and vulnerable animals, birds, fish and plant species, including 12 species of migratory birds protected under international agreements signed by Australia, China and Japan. The Barrick Gold Corp.’s past international record of poor business choices and a lack of accountability for problems that arise at their mine sites does not bode well for the preservation of Lake Cowal. The company has been the target of lawsuits and financial investigations in the United States, Chile and Peru, where Barrick was charged with unlawful price manipulation, antitrust violations, tax evasion and unfair trade practices and evictions. To clear the way for the Lake Cowal mine, Barrick felled river red gum trees and laid water pipes and an electric transmission line. Dozens of trees that sheltered Wiradjuri people from the elements for hundreds of years and held historic markings of generations have been eradicated. Artifacts present on site remain vulnerable since Aboriginal owners have not been given an opportunity to collect them. The artifacts hold individual significance, but more importantly, they are parts of a larger landscape of spiritual significance, and piecemeal collection compromises the integrity of the whole site. The Coalition to Protect Lake Cowal, an alliance of more than 40 international and 21 Australian groups, joined the Mooka Traditional Owners as well as some traditional owners from the Wiradjuri Nation to support each others’ work to prevent gold mining at Lake Cowal. In 2003, Barrick obtained permission to destroy the sacred site from some Wiradjuri people who, according to Wiradjuri Elder Neville Williams, were not authorized to speak for the community. A small group of Wiradjuri people calling themselves the “Condobolin Wiradjuri Native Title Claim Group” signed an agreement with Barrick to proceed with the mine. Williams is the chairperson for the Mooka/Kalara united families and represents some 1,000 Wiradjuri people. He has seen many a day in court, utilizing the legal system to try to keep the mine at bay. In March 2002, Williams succeeded in getting an injunction to restrain Barrick from exploration of Lake Cowal due to the company’s desecration and removal of cultural objects. Williams then challenged in court the authority of the other Wiradjuri group to negotiate with Barrick over the Wiradjuri native title claim; the case is still before the courts. Protesters have successfully integrated direct action into their work to make their opposition visible to lawmakers and the public. Neville Williams set up a protest camp on the site of the proposed mine six years ago. Williams brought a flame from the sacred fire at the Aboriginal Tent Embassy in Canberra in August 2003 to be kept at the protest camp. Although the fire was maintained under close supervision by camp occupants and was legally allowed under section 116 of the Australian Constitution, which gives all Australians including Aboriginal people the right to practice their own religion, police raided the camp and extinguished the fire three times. The first incident occurred in November 2003, the second in February 2004, and the third in April 2004 when police shut down the camp. The camp served as one of many locations where direct action has taken place to stop the mine. During Easter weekend 2004, more than 150 supporters attended a protest at the camp against Barrick’s Lake Cowal Project. Individuals from around the world gathered to participate in direct action at Barrick’s headquarters to call attention to the controversial mine, listened to speakers, and held strategy sessions at the Cowal Gold Project Site. The Coalition to Protect Lake Cowal organized a National Day of Action on May 20, 2004, during which concerned citizens took to the streets to oppose the mine. Peacebus’s CyanideWatch campaign, the Coalition to Protect Lake Cowal, and partner organizations have since hosted several protests at the mine’s entrance to rally support for the closure of the Lake Cowal Gold Mine and to push for a ban on cyanide heap-leach mining. In late 2006, the Coalition to Protect Lake Cowal organized two protests. One focused on Barrick Gold’s suppliers and involved the occupation of the Melbourne offices of Orica (a supplier of cyanide based in Gladstone, Queensland) by nearly 100 protesters. Orica management called in the police, but the protesters acted peacefully, handing over a documentcalling for the end of cyanide transport to the mine. They asked that Orica fax it to all the communities along the route to the mine. In another organized protest, several people walked from Brisbane along the cyanide transport route to Lake Cowal and then to Melbourne in a demonstration of outrage about the effects of cyanide heap-leach mining on humans and the environment. Both protests captured the Australian media’s interest. After approving Barrick’s permit for the Cowal mine in 2000, the New South Wales government established the Lake Cowal Foundation as a nonprofit trust to manage the environment around the mine and to meet demands of several environmental organizations. With nonindigenous board members and scientists leading the foundation, efforts toward conservation, sustainable farming and community education have gotten underway despite local worries about the lack of Wiradjuri representation. Local farmers have publicly decried Barrick’s use of egregious amounts of pure drinking water to leach the gold from the soil during a time of severe drought when locals are unable to water their stock or crops. The mine runs 24 hours a day all year, a practice that has led to a 100 foot or more drop in the ground water level at the Bland Paleochannel. Barrick has reportedly made a recent deal with some irrigators to use Lachlan River irrigation water in mining rather than groundwater and let some of the water relieve locals’ parched lands. Currently, it is unknown just how much these measures have allayed the community’s opposition to the mine, and recent media attention has all but ignored the outstanding issue of the desecration of the sacred lake. If you’re in Australia, show support at this year’s Easter protest. “Lake Cowal Gold Mine.” Peace Bus. “Save Lake Cowal.” Friends of the Earth Australia. Rainforestinfo.”Office Occupation at Oricas Head Office in Melbourne.” News release, November 17, 2006. “Premier to open Lake Cowal mine.” ABC News Online, September 29, 2006. Pillay, Sam. “Gold Mine Threatens Sacred Lake Cowal,” Green Left Weekly, June 30, 2004. “Aboriginal Landowners Fight Off Barrick Homestake and Gold Mining.” Drillbits & Tailings Vol. 7, No. 1, January 31, 2002. Herz, Steve. “Horror Stories From an African Mine.” Friends of the Earth Newsmagazine Vol. 32, No. 2., Summer 2002.